Legal Status: Diplomatic immunity as head of state. Skills and abilities: Skilled tactician, leader and fighter. Powers: Limitless Superhuman strength and endurance while within the boundaries of Tundi. This bond with the land is symbiotic meaning while he is touching it the land itself and its people are endowed with strength and vitality. 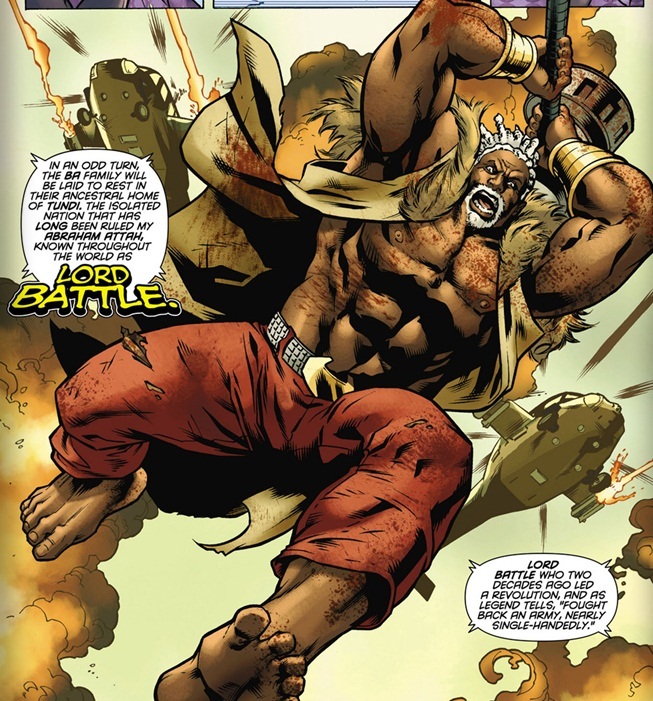 His body also grows taller and has increased mass while in Tundi, once removed he loses his powers and the land and people of Tundi grow weak and sickly. Leader of the African Nation of Tundi. Two decades ago he led a revolution where he fought back an army single handedly. After he took over Tundi he sealed off the borders and the nation became a police state though he remained friends with Governor Ba. After Ba’s death he allowed the entire family to be buried there. Along with his honor guard who are always with him (four) he resides in the capital Sango. Here he welcomed Matu Ba the last surviving member of his family. When Ba discovered his nation had discovered oil he shot him and this lead to a conflict with Batwing and the JLI. He is eventually defeated and jailed in Tundi because his removal would harm the land. ← Injustice: God’s Among Us has Cyborg!